The following pages detail all known Kenner (US) cardbacks. Foreign licensee variations are detailed under each licensee heading, and any cardbacks not featured below will be detailed there. 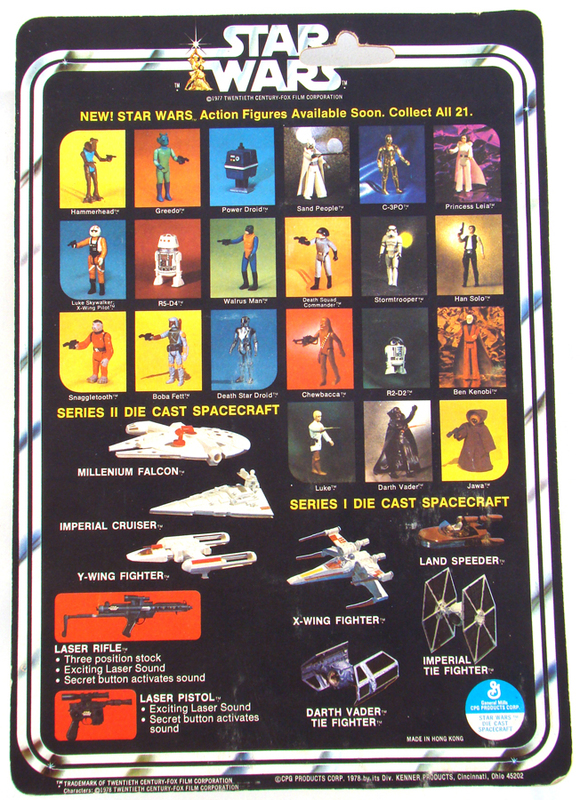 The first issue die cast cardback shows the 1978 released first 12 action figures on the rear of the card. The card postdates its 3 and 3/4” counterpart as it shows photos of the available action figures in 12 individual squares, rather than a line of hand drawn characters. 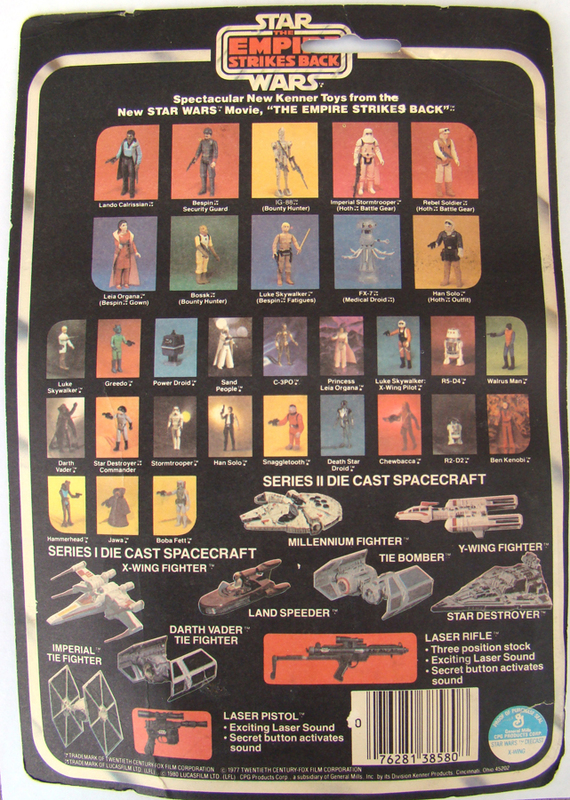 The die cast cardback also featured the now highly sought after vinyl caped Jawa. Only the Land Speeder, X-Wing and TIE Fighter were available on these cards but these ships were not advertised on the cardback - presumably as they were still in pre-production during the design of the card. 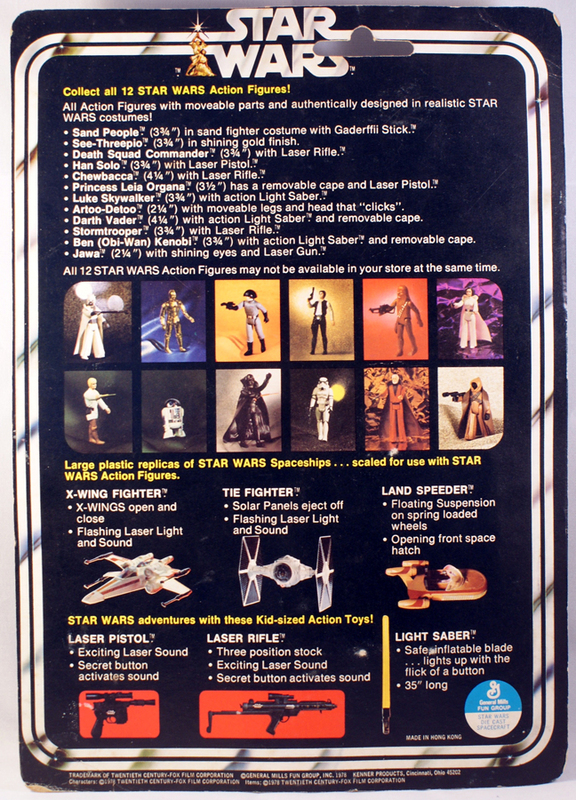 The lower half of the cardback shows the equivalent large scale ships rather than the die cast versions, and also features the ‘kid-sized’ Laser Pistol, Rifle and Light Saber. The front of the Land Speeder SW12A eroneously featured a mirror image of the toy, which was subsequently corrected on the SW12B card although the SW12B back remained the same. The SW12B is identical to the SW12A, but reflects the correction to the front of the SW12A Land Speeder. No other Series 1 ship has yet been found with a corrected card front. 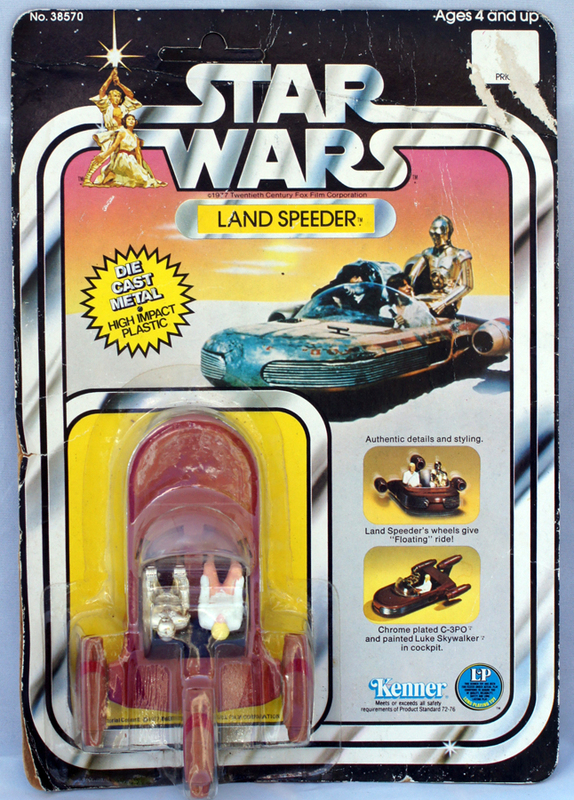 The front of the Land Speeder SW12A eroneously featured a mirror image of the toy, which was subsequently corrected on the SW12B card. 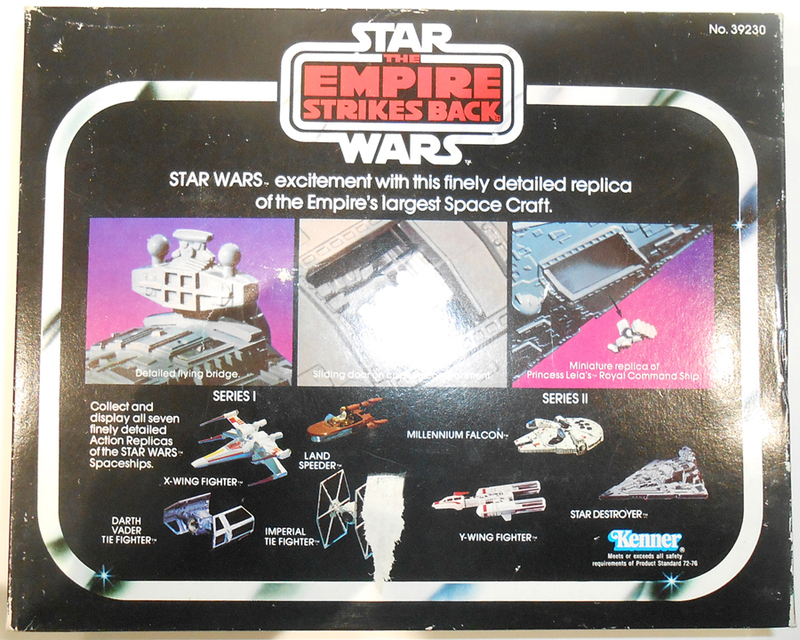 The three ships initially released on the 12 backs were re-released on 21 back cards along with the Darth Vader TIE Fighter. 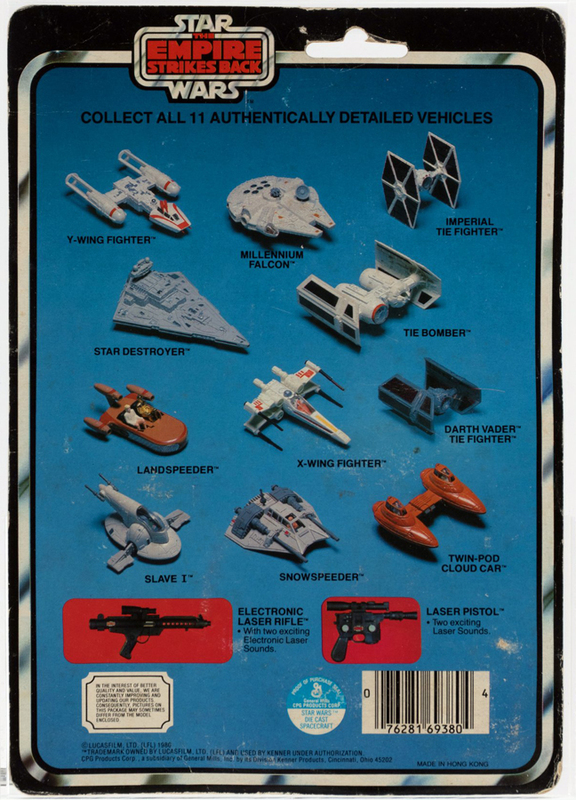 The 21 back featured the same 21 photos as the equivalent Kenner action figure cardback, but also featured photos of the available die cast range. The photos included images of prototypes for the large sized Series 2 ships, the TIE Fighter was renamed ‘Imperial TIE Fighter’ and Kenner QC failed to spot the typo in Millennium Falcon. The ‘kid-sized’ blasters were still featured but the light saber was removed. The Y-Wing, Millennium Falcon and Imperial Cruiser were too large to be supported by a blister card, and were released in blister boxes around the time of the release of the Darth Vader TIE Fighter. Despite their near simultaneous release the Darth Vader TIE was included in Series 1, whilst the larger ships were Series 2. The backs of the boxes did not feature any action figures but like the 21 backs featured the full range of the die cast ships, with the Imperial TIE fighter now also replacing TIE Fighter. The photos were still those of the prototypes for the Series 2 ships – despite their obvious difference form the actual toy, but 'Millennium' was now corrected. 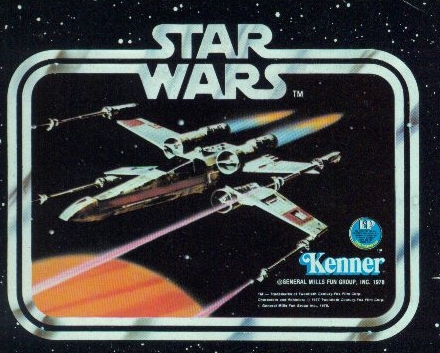 The upper part of the box art detailed features of each ship, and one of the most obvious Quality Control oversights of the entire Kenner line. 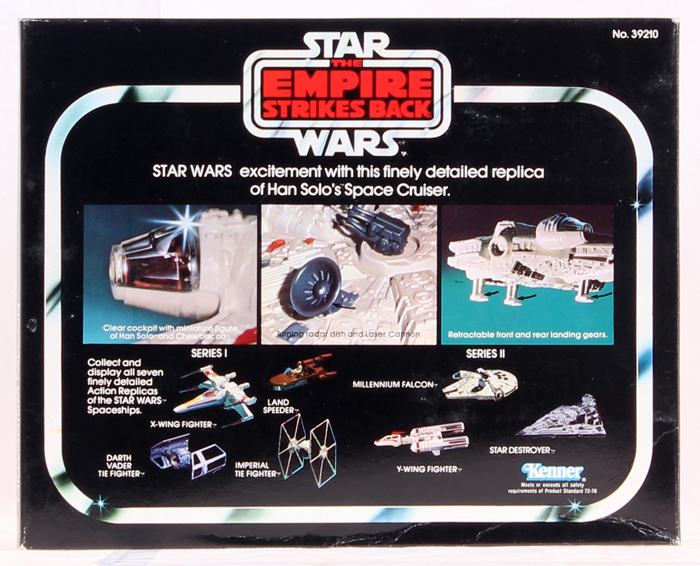 The text describing the Imperial Cruiser as ‘the Empire’s largest Space Craft’ was repeated on the boxes for the Y-Wing and the Millennium Falcon. 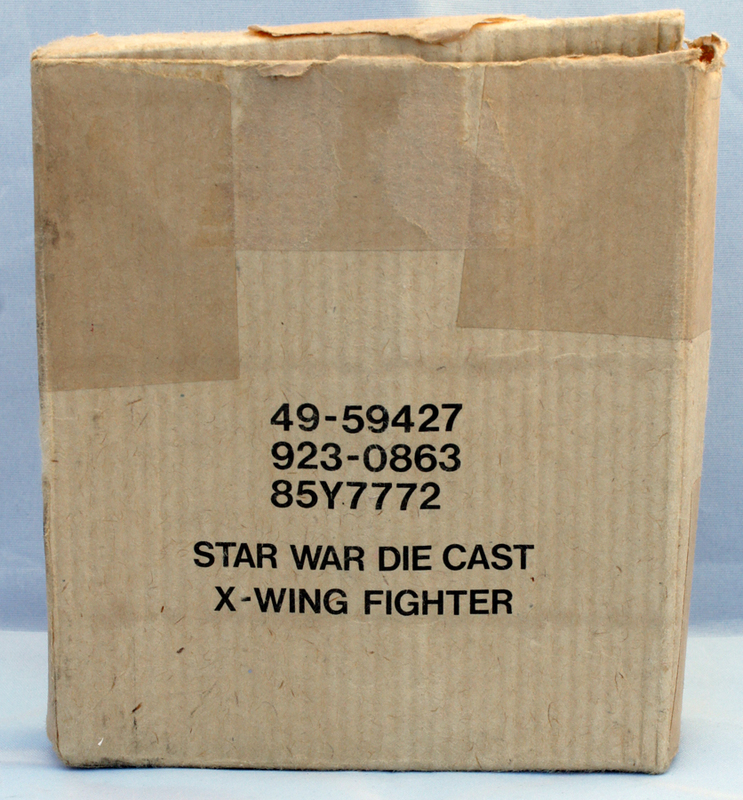 The boxes are the first example of Kenner using both ‘diecast’ and ‘die cast’ on the packaging. 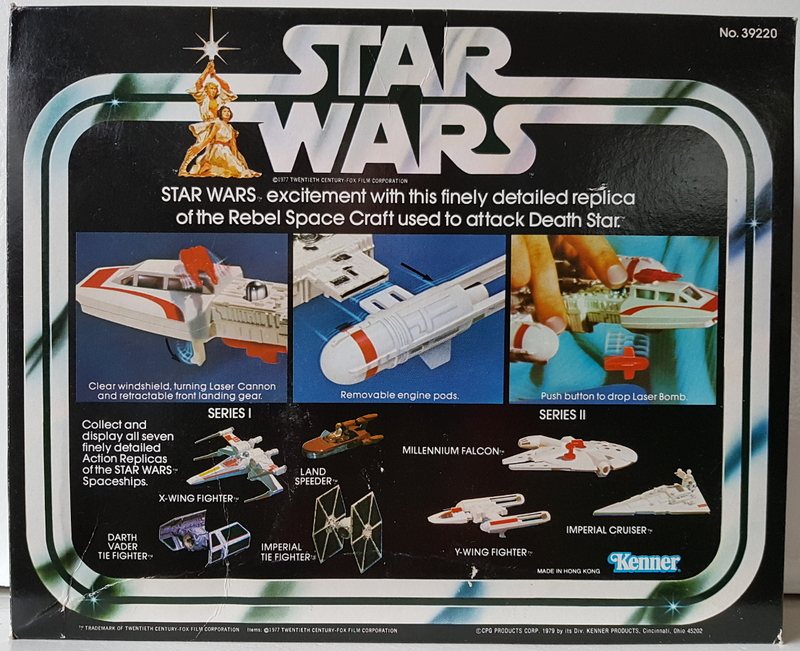 The Series 2 ships were also released in Special Offer boxes, which included either a card backdrop featuring the Y-Wing, Millennium Falcon or Imperial Cruiser in action. 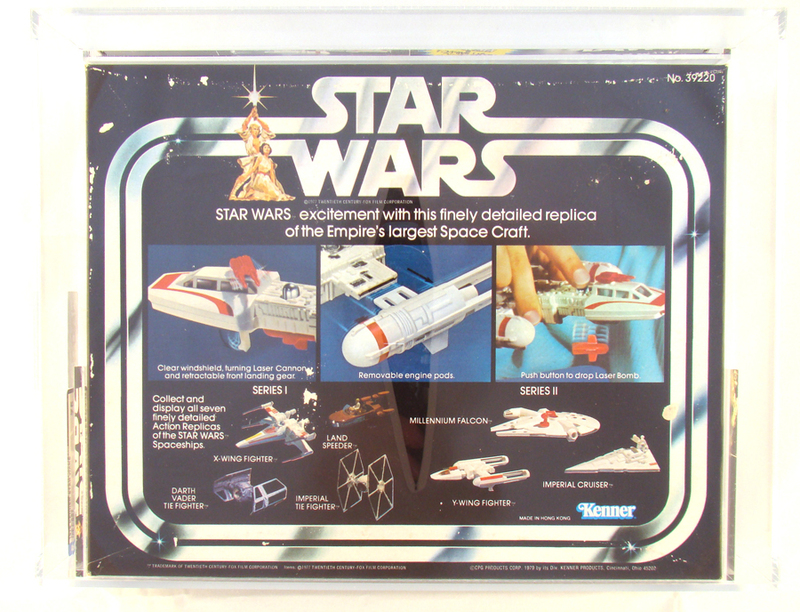 The back of the box featured this ‘In-flight space attack scene’ as well as detailing the action features of the toy. 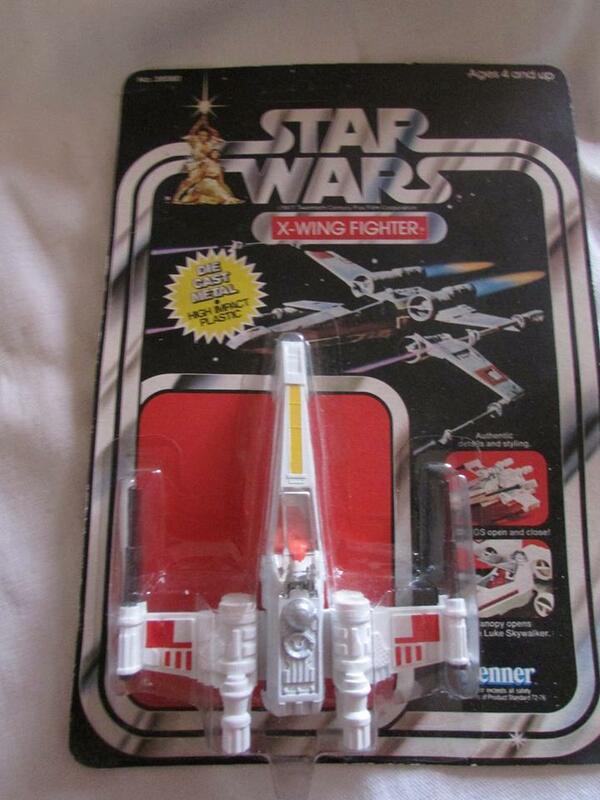 The erroneous ‘Empire’s largest Space Craft’ text was still not corrected on the Y-Wing or Millennium Falcon boxes. 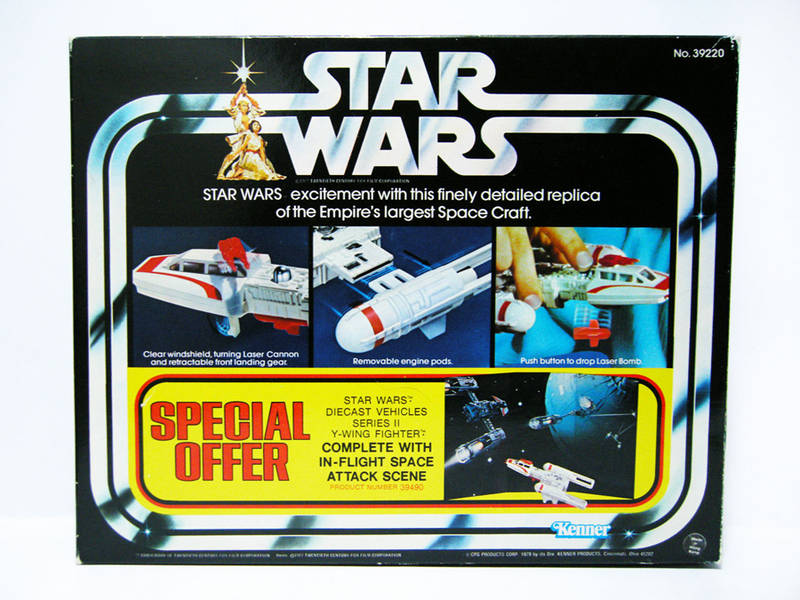 Following the release of the Special Offer die cast ships the packaging for the Series 2 ships was changed a second time. In what must have been a short-lived change the boxes reverted to the original SW7 style boxes but with corrected text on the reverse. The erroneous ‘Empire’s largest Space Craft’ text was now corrected on the Y-Wing and Millennium Falcon boxes and now matched that on the front. 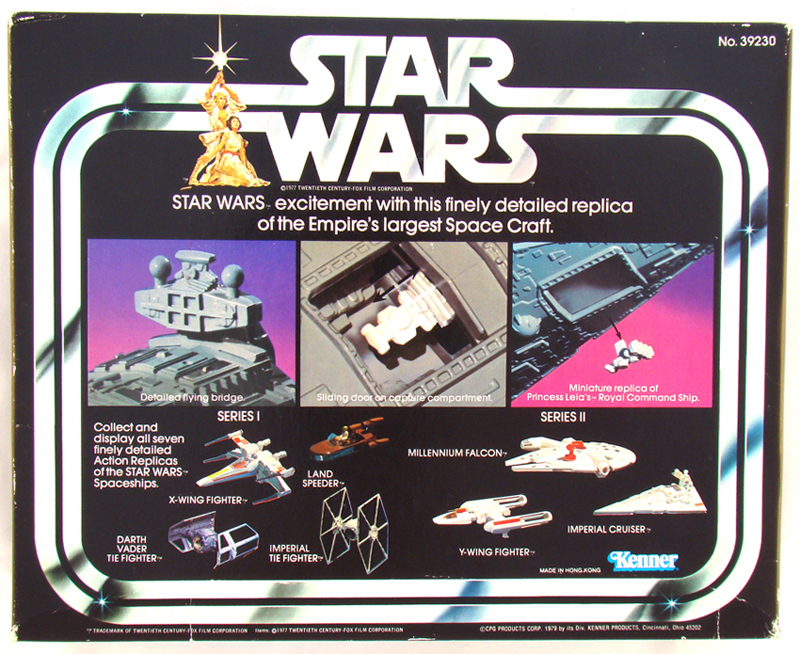 The Series 2 larger ships were re-released in Empire Strikes Back packaging. 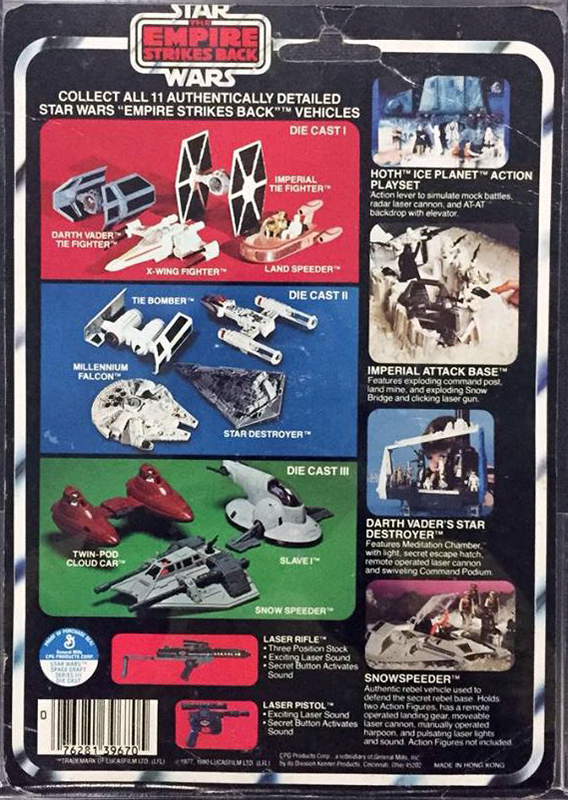 The boxed toy's action features were shown and all 7 die cast ships on a plain black background. The Imperial Cruiser was first renamed 'Star Destroyer' on the ESB7 boxes. 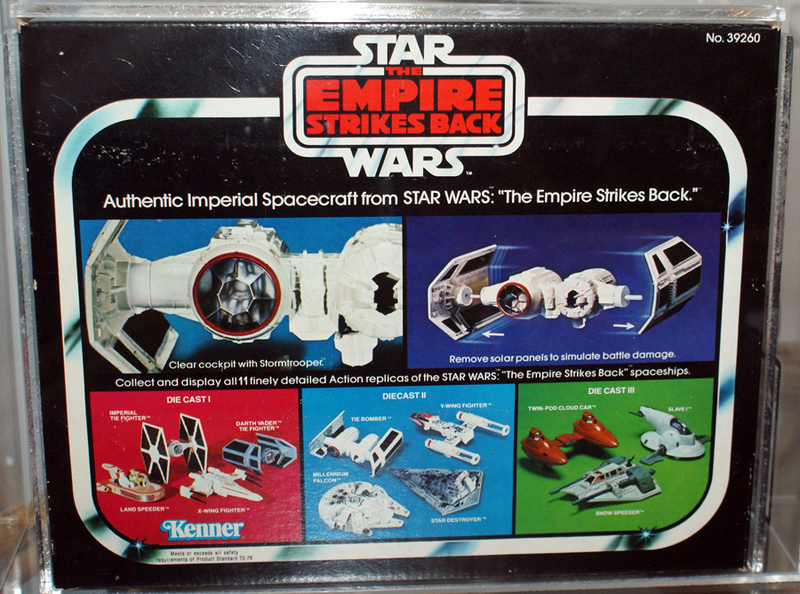 The die cast line continued into 1980 and was re-released on Empire Strikes Back packaging. 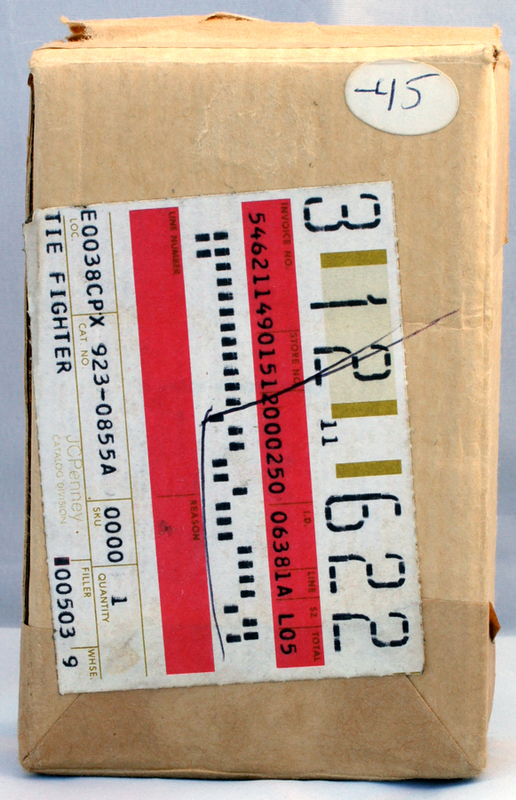 The Series 1 X-Wing and Imperial TIE Fighter were released on 31 backs – again using the character photos featuring on the equivalent 3 and 3/4” action figures cardbacks. The die cast line and ‘kid-sized’ blasters also featured. 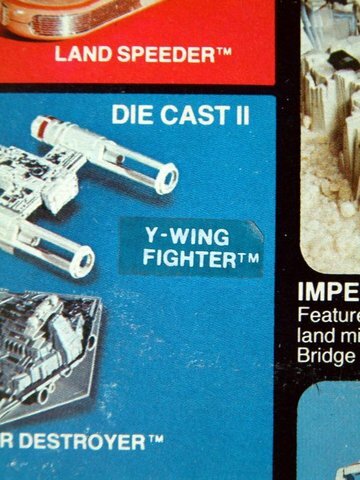 A photo of a prototype die cast TIE Bomber now formed part of Series 2 and photos of production-like toys were used for the other Series 2 ships. 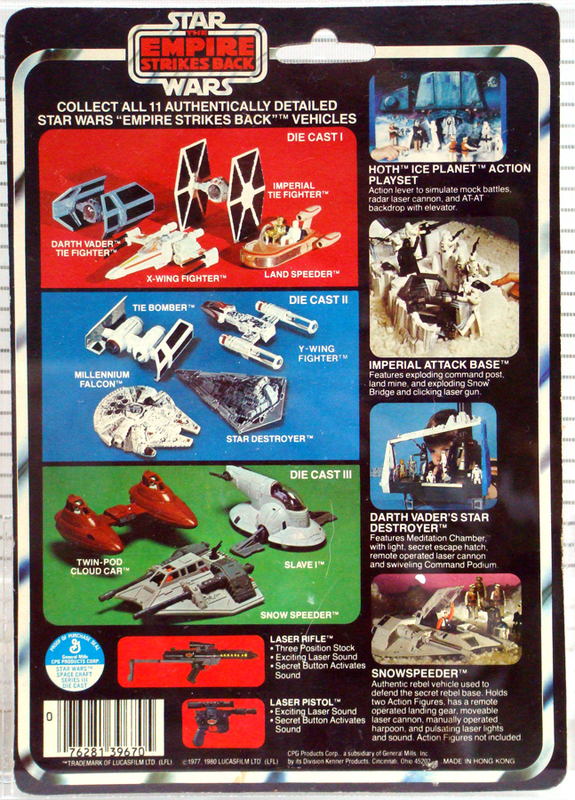 The Empire Strikes Back packaging was subsequently updated following the release of the Series 3 Twin-pod Cloud Car, Snow Speeder and Slave 1. 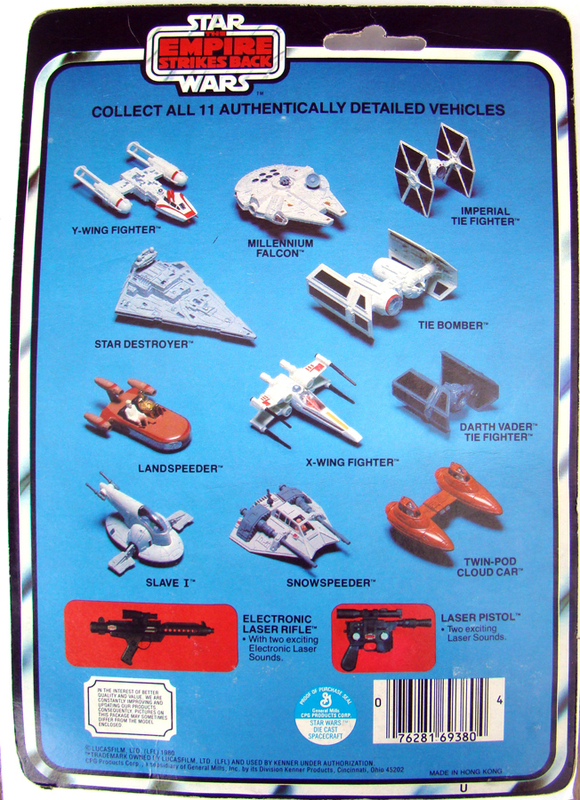 The cardbacks featured the 11 die cast ships with each series of toys in three separate colour blocks, as well as featuring the ever present ‘kid-sized' blasters - now featuring ESB logos. The cardback also feature the Hoth Ice Planet and Imperial Attack Base playsets, and the Darth Vader’s Star Destroyer and Snowspeeder for the action figure line. 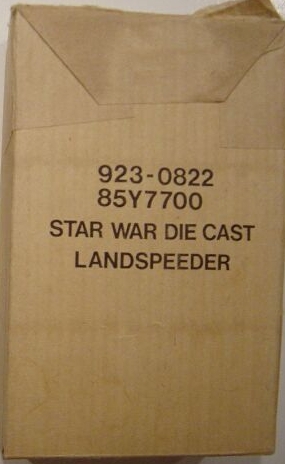 The Action Figure and Die Cast branches of Kenner seemed to disagree on the spelling of Snow Speeder – is it one word or two? The first issue ESB11A card erroneously omitted 'Y-Wing Fighter' and instead featured a sticker next to the Y-Wing with the corrected text. The card back is identical to ESB11AY with corrected text in place of the Y-Wing sticker. 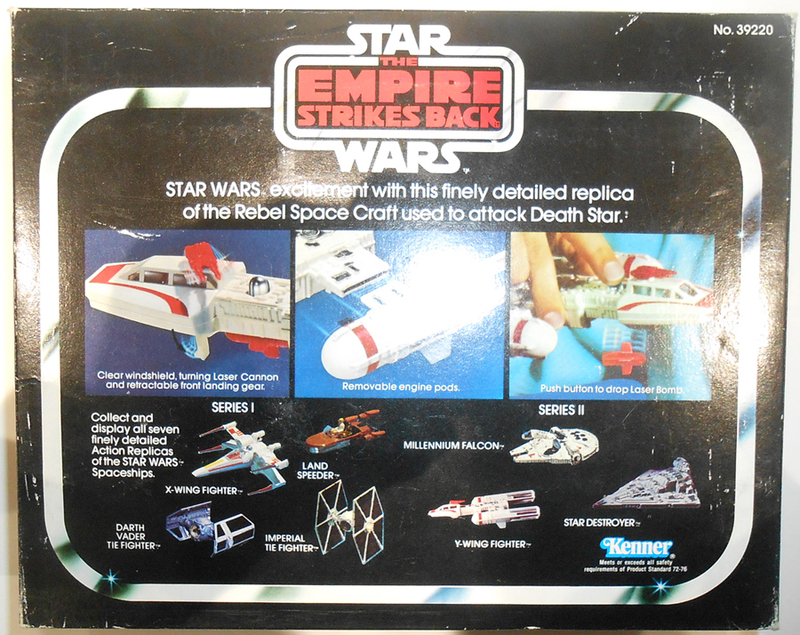 The Series 2 larger ships were initially re-released in Empire Strikes Back packaging (ESB7) prior to the release of the TIE Bomber. 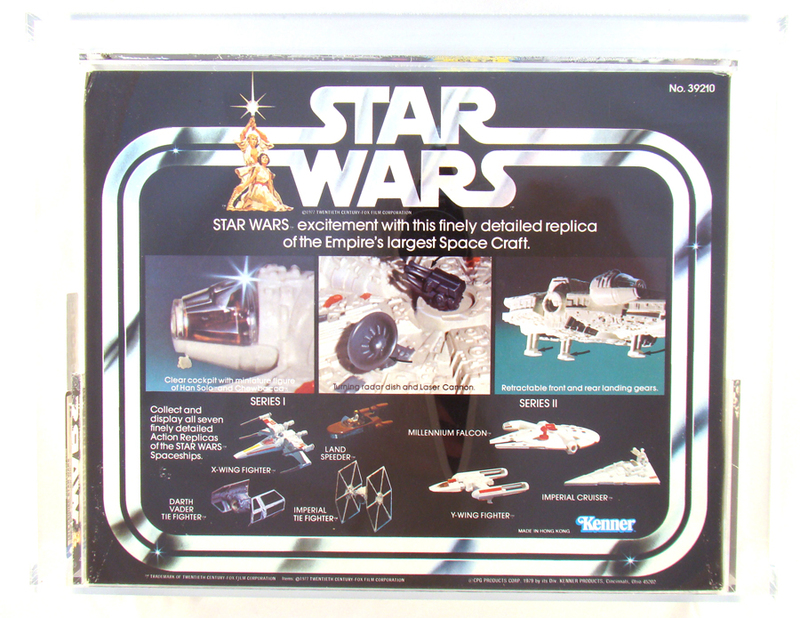 The TIE Bomber was released separately and the box showed photos of the featured toy’s action features and the 11 die cast ships in three separate colour blocks. 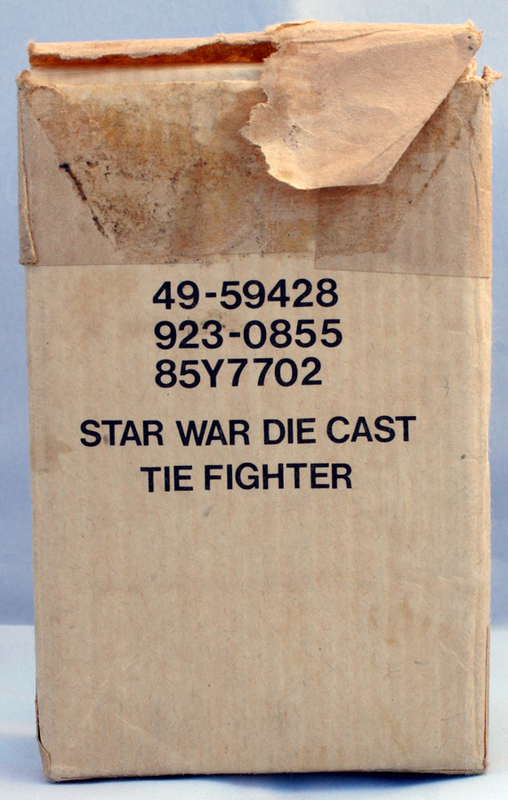 The other Series 2 ships were apparently not released in ESB11B boxes. Reflecting a change also seen in the 41 back action figure cards, the multi-coloured 11 back was replaced with a plain blue back featuring all 11 die cast ships. In the little known Kenner spelling bee of 1981 the Action Figure team won, with ’Landspeeder’ and ‘Snowspeeder’ replacing ‘Land Speeder’ and ‘Snow Speeder’ on the die cast cardbacks. The ever present ‘kid-sized’ blasters were the only other toy line featured. The ESB11C van be found with a 'U' (Made in Hong Kong), 'MB' (Made in Macau) or no letter (Made in Hong Kong) printed in the bottom right of the racetrack. The no letter example (ESB11C N) seems rarest. Slave 1 and the Snowspeeder can be found on all cards but as yet no examples of Made in Macau Cloud Cars (ESB11C MB) have been recorded. A hybrid card can also be found featuring a SW21 front and an ESB11C cardback. 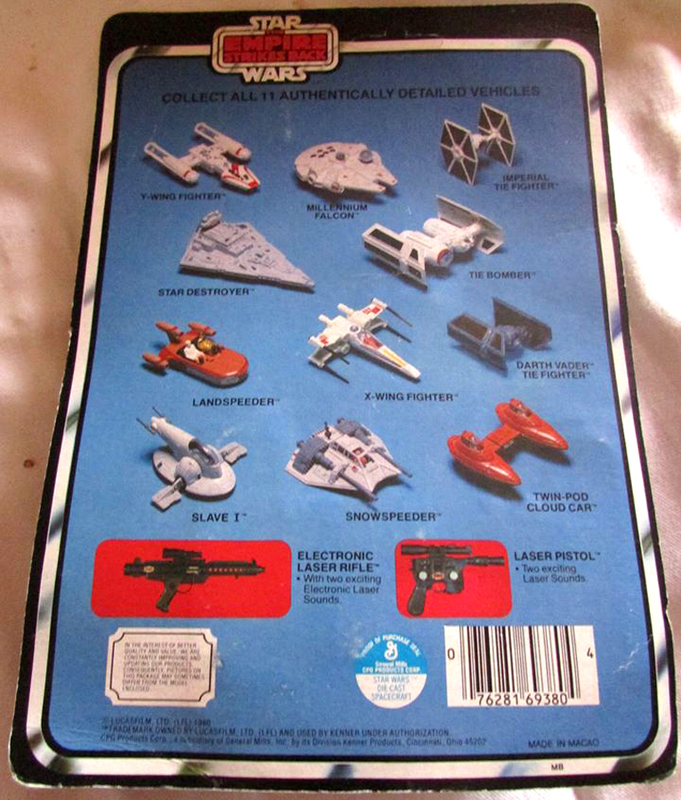 The back is plain blue and features all 11 die cast ships, with the ever present ‘kid-sized’ blasters. 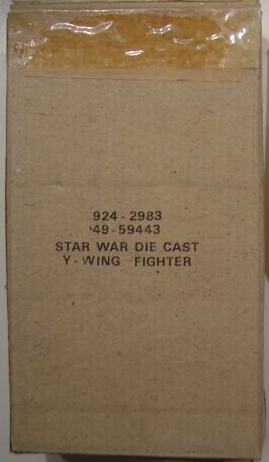 So far only the X-Wing Fighter has been recorded on this cardback and potentially only sold in low numbers in Asia. 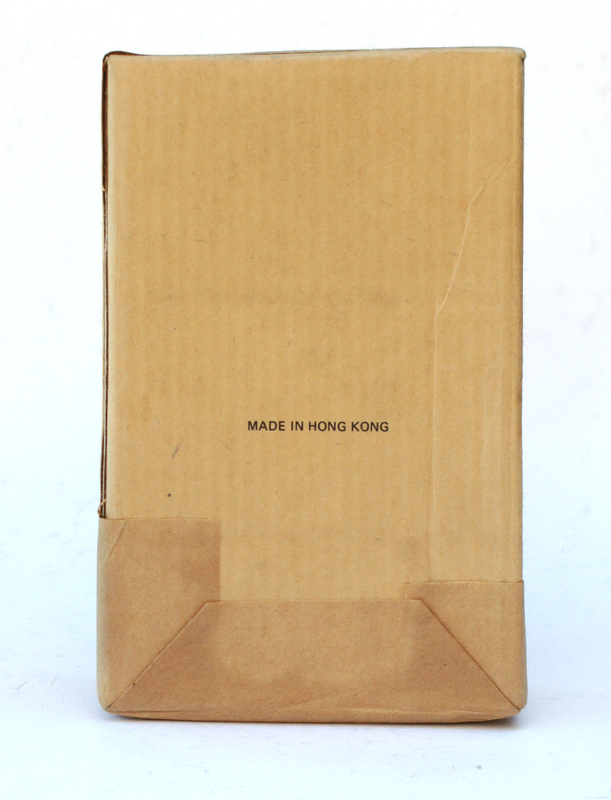 The ESB11D can be found with both Made in Hong Kong (U) and Made in Macau (MB) printed on the cardback. Made in Macau die cast vehicles are rarer than their Hong Kong counterparts and significantly these examples show that the hybrid card was not restricted to just one factory. 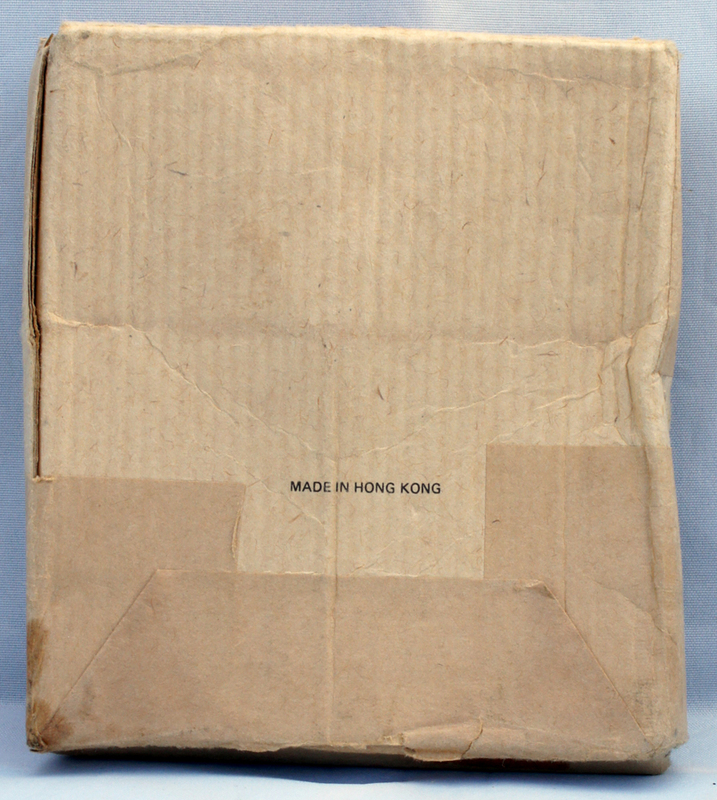 As yet no examples have been recorded of a Made in Hong Kong no letter example (ESB11D N). 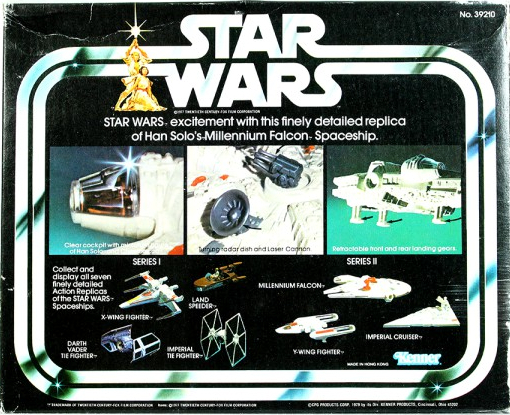 The die cast ships were available to buy through catalogues in the United States and Canada. 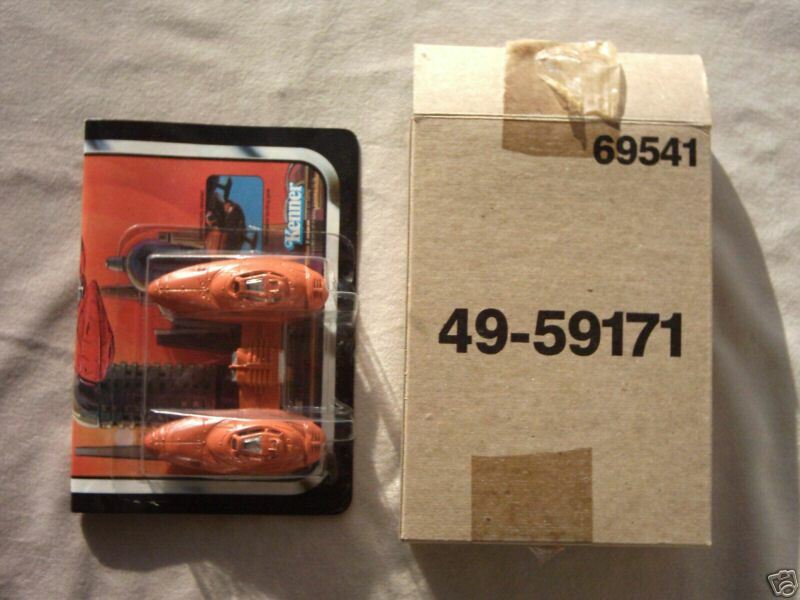 The toys were shipped in plain mailer boxes with the Wave 1 and Wave 2 ships (apart from the Land Speeder) available through Sears, JC Penney's and Aldens catalogues, with the Land Speeder only available through JC Penney's and Aldens. 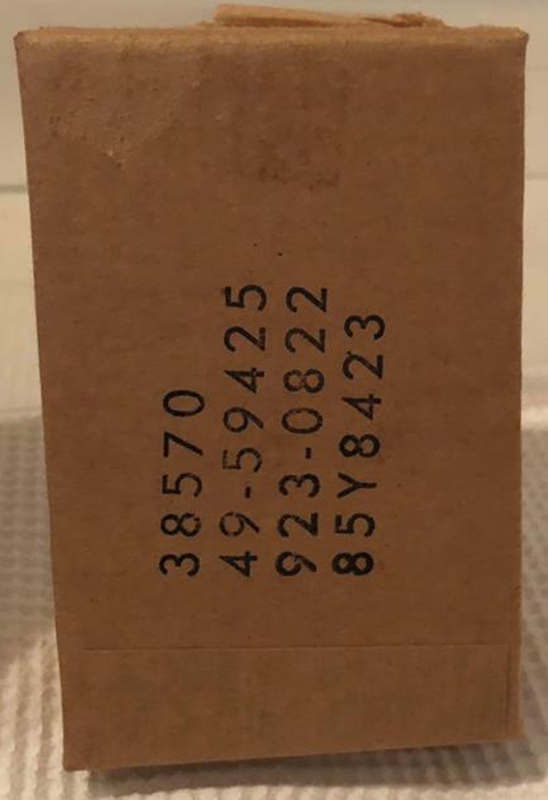 Sears boxes can be identified by their 49-59xxx code written on the box, although boxes with these codes can be found with alternitve store stickers. 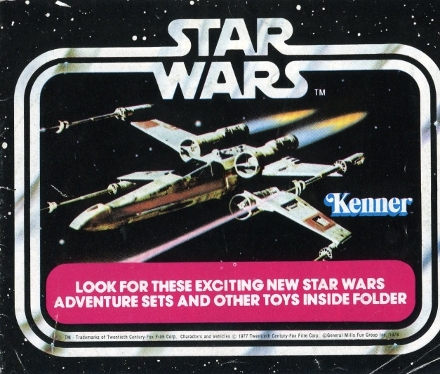 The first issue boxes included the toy, paper packing and the first issue Kenner collections catalogue, with the later boxes including the second issue catalogue with pink banner and the name of the ship printed on the box. Each later box proudly states 'Star War' in another of Kenner's quality control oversights. 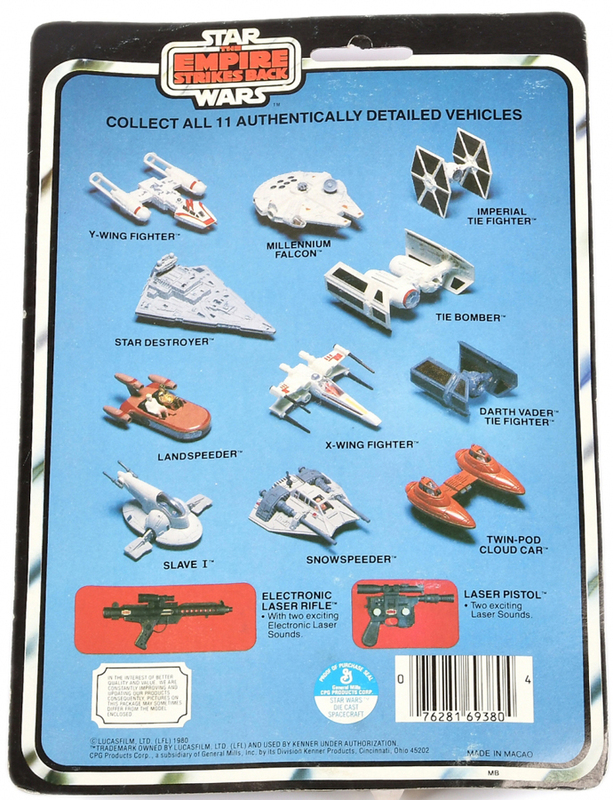 Boxes were plain card and featured the assortment number for each ship with or without the vehicle name. The vehicle name was not printed on the first issue mailers but some 'blank' boxes have the ship name hand written in pen. 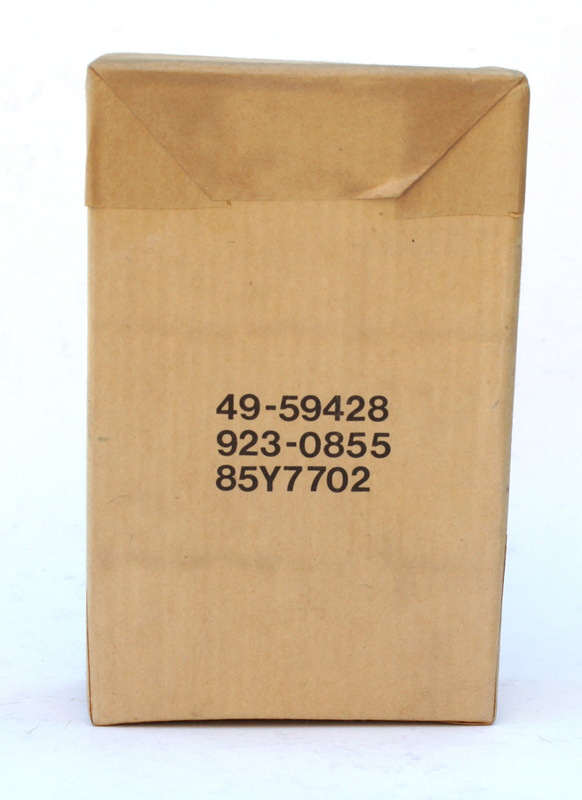 The boxes can have the text written vertically or horizontally. Sears first issue vertical text box image courtesy of Justin Lea. Imperial Cruiser The Slave-1, Cloud Car and Snow Speeder were only sold in Sears catalogues and each box contained the carded vehicle folded in half and a catalogue. No attempt has been made to catalogue the store variations on this site - we'll save that for another day.